The Montecito Fire Protection District recognized the recent promotion of three employees and hiring of two new Chief Officers with a ceremony on Monday afternoon during the Regular Meeting of the Board of Directors at Fire District Headquarters. Jordan Zeitsoff was promoted to Engineer. Engineer Zeitsoff began his career in Emergency Services in 2002, when he worked as an EMT for American Medical Response in Los Angeles. In 2004, he was hired as a firefighter for the United Stated Forest Service where he worked on an engine, a Hotshot Crew, and a Helicopter Rappel Crew. In May of 2008, he was hired as a firefighter by Montecito Fire. In addition to his wildland firefighting skills that come from his experience with the Forest Service, Engineer Zeitsoff has a Bachelors Degree in Political Science with a Minor in Spanish and an Associates of Science Degree in Fire Technology, and has completed the California State Fire Officer Certification. Engineer Zeitsoff and his wife Jessica live in Santa Barbara with their 2 children Mylia and Dennen. Scott Chapman was promoted to Captain. Prior to being hired by Montecito Fire in May of 2006, Captain Chapman spent one year as an EMT with American Medical Response in Hollywood, and five years with the United States Forest Service as a Los Padres Hot Shot from 2001-2005. Captain Chapman has served on the Apparatus and Equipment Committee, as well as the Promotional Committee. He was also the President of the Montecito Firefighter’s Association for two years. Captain Chapman has completed his California State Fire Officer Certification and will be earning his Associates of Science Degree in Fire Technology this semester. He and his wife Ashley live in Santa Barbara with their son Samuel and daughter Emery. Drue Holthe was promoted to Captain. Captain Holthe was hired by Montecito Fire in August of 1988, and promoted to Engineer in June of 1991. 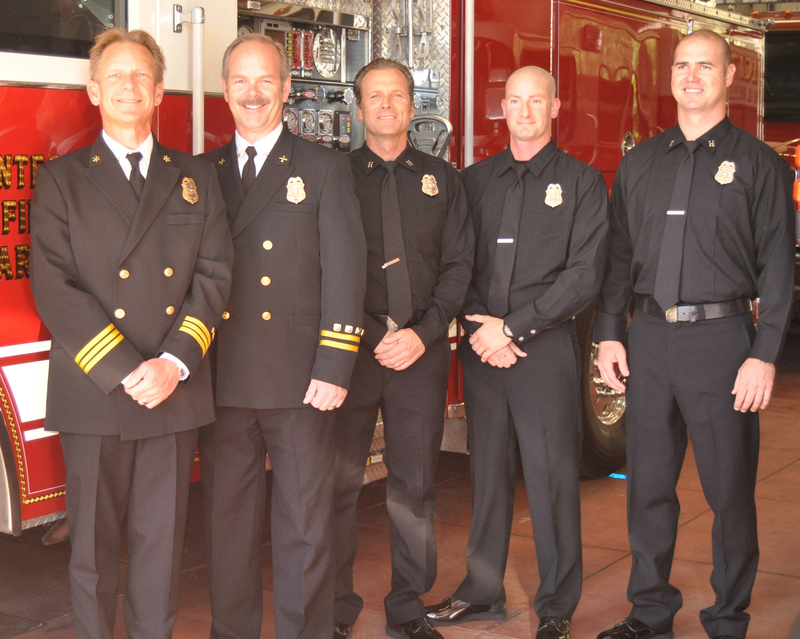 Prior to being hired by Montecito Fire, Captain Holthe developed his firefighting and EMT skills while working with the Orange County Fire Department, Medic Ambulance Service, Anaheim Fire Department and General Dynamics Fire Department. During his tenure at Montecito Fire, Captain Holthe has completed his California State Fire Officer certification, served on the Equipment and Apparatus Committees, was the Department representative for DMV Commercial Drivers testing and was an instructor for NAPD (National Academy of Professional Driving) Driver Training Program and the Department All Steer Training Program. Captain Holthe lives in Ventura with his wife Kelly and daughter Ella. Alan Wildling was hired on February 1, 2015 as a Shift Battalion Chief. Chief Widling recently left his position as Battalion Chief with Santa Maria Fire Department to accept his new position at Montecito Fire. Chief Widling began his career in Emergency Services in 1986 as a private ambulance company Paramedic. He became a Reserve Firefighter for the Santa Maria Fire Department in July of 1987, and in 1989 he became a full-time Firefighter with the Montecito Fire Protection District. Two years later, he left Montecito Fire to work full time with Santa Maria Fire Department, where he promoted through the ranks, eventually reaching the position of Battalion Chief. Over the course of his career, Chief Widling has responded to many significant events both in our local area and across the State, including structure fires, wildland fires, earthquakes, mudslides and the civil unrest associated with the Rodney King Trial in Los Angeles. Chief Widling has been an adjunct instructor with the Allan Hancock College Fire Academy for many years. In 2000, he was recognized by the Tri-County Fire Chiefs Training Officers Association as their Fire Instructor of the Year. He has completed California State Fire Marshal’s certification as a Senior Instructor for Confined Space Rescue and Chief Officer Certification. Alan also holds a Bachelors Degree in Occupational Studies/Vocational Arts. Chief Widling and his wife Anna raised their three children Bethany, Stephen and Michael in Santa Maria and have two grandchildren, Anthony and Annabelle. Chief Widling and his wife Anna will be relocating to the City of Solvang in March. Kevin Taylor was hired on February 1, 2015 as a Division Chief of Operations. Chief Taylor comes to Montecito Fire after spending 24 years with the Paso Robles Fire Department where he held the ranks of Firefighter/Paramedic, Fire Captain/Paramedic and for the last twelve years, Battalion Chief. Chief Taylor is an experienced Chief Officer; he was the incident commander for the San Simeon Earthquake and several greater alarm incidents in Paso Robles. He also participated on California Team 9 and was a founding member of the San Luis Obispo County Type 3 incident command team. Chief Taylor was an active member of the San Luis Obispo County Operational Area representing the San Luis Obispo County Fire Chief’s on several fire and EMS committees. He also has a Bachelor’s degree in Fire Administration and will complete his Master’s degree in Emergency Services Management early next year. Chief Taylor and his wife Jo will celebrate their 24th wedding anniversary this June. Their son Jake is a senior at Paso Robes High School. Chief Taylor has relocated to Montecito and his wife Jo will join him after his son graduates from high school.